It was already reported that the film Appatakkar is in its final leg of shooting. Further, this commercial flick directed by Suraj with music composed by S.S.Thaman is expected to have its audio launched around mid-April or May. 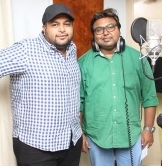 Recently music director Imman sung a song for Appatakkar, titled 'Bujjimaa' and the lyrics were written by Na Muthukumar. Appatakkar is filled with surprises on the musical front as a couple of weeks ago, Simbu and Swati Reddy were roped in for singing a duet song. People looking for online information on Anjali, Appatakkar, Imman, Jayam Ravi, Suraj, Thaman, Trisha will find this news story useful.